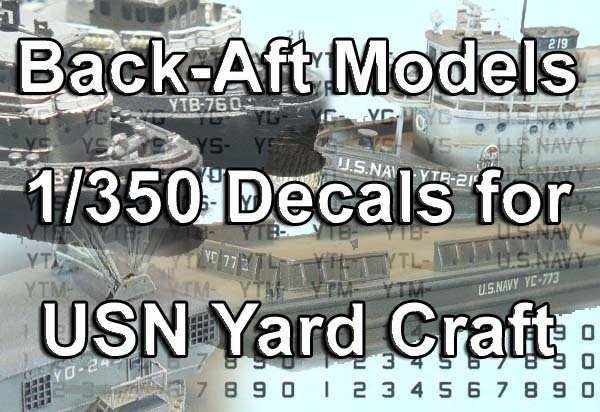 Back-Aft Models is at it again with this decal set for U.S. Navy Yard craft in 1/350 scale. The decals are sharp and clear and well registered. They are already separated around each number letter or phrase, so you don't have to trim them. 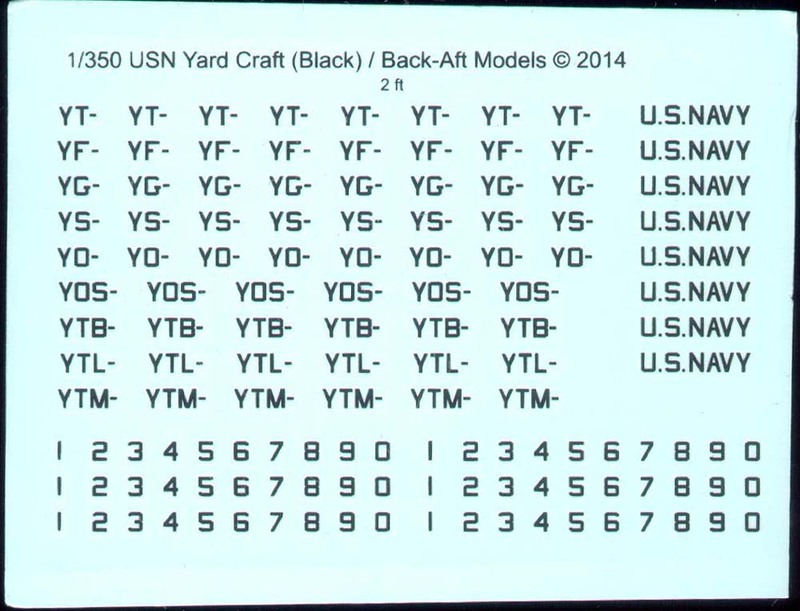 The black letters include grouping of common designations such as: YT, YF, YG, YS, YO, YOS, YTB, YTL, YTM, U.S. NAVY, and numbers 1 through 0. Letters are two scale feet high. In 1/350 scale that measures out to be 11/16" (1.74 mm).. The decals are available in white or black, or both as a set. The white set includes all of the above along with letters of the alphabet in multiples of six. In the second image on the right for the white decals set I have manipulated the contrast to help show the actual letters. White on white doesn't show up too well so I'm including Back-Aft's decal artwork so you can see the actual letters and numbers available. These decals can be used for all sorts of tugs, barges, floating cranes and other miscellaneous craft. There are more than enough markings in this set to do a complete dockyard. These decals are also available for 1/700 scale modelers. We will feature those in a separate review. You can buy this set direct from Carl on the Back-Aft Models website.